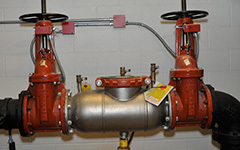 Backflow preventer inspection & repair services. Pye-Barker Fire & Safety provides the inspection and repair of backflow preventers, which prevent unsafe water from reversing flow and contaminating clean water. A Backflow Preventer is essential, especially for public water systems or a customer’s potable water system. To schedule backflow preventer inspection or repair contact with your area Pye-Barker representative today.